People often say that when you arrive somewhere new, you should get up high to get the lay of the land and work out what’s what. In Addis Ababa, this is a must – sprawled over 203 square miles, getting your bearings isn’t for the faint-hearted. You would think that getting a view in Addis would be easy – there are tower blocks going up on every corner. I’ve heard that a building won’t get planning permission now if it’s less than nine storeys. I don’t know how true this is, but when you see the building site that is Addis, you can certainly believe it. The problem however with most of these tower blocks, is that very few of them are accessible. They tend to be shops for the first few floors, with everything above being used as offices. When I first arrived I successfully made it to the top of one of these office blocks (not yet understanding the format) and emerged from the lift on the tenth floor into someone’s office. It was slightly awkward to say the least, but they had a great view, and it made me want one too. And so the hunt began for where to go to really see and understand Addis, ideally with good food and drink to accompany. For years, Top View has been the natural suggestion. That is, until the Belle-Vue Hotel and Spa was built in front of it, leaving Top View, viewless. To say this is a shame is an understatement – Top View is a beautiful Italian restaurant nestled into the hill behind Meganegna roundabout, with what would have been panoramic views across the city. The prices seem to have reduced since they lost their view, and it is certainly still worth visiting. This has allowed Belle-Vue Hotel and Spa to probably stand as the best place to go if you want an aerial view of the city. Head to Bar Osaka on the seventh floor to see Addis sprawling in-front of you, taking in the airport to the South, the city to the West and the surrounding Entoto hills holding everything in place. The glass lift that clutches to the side of the building gives you a glimpse of the city below as you head up to the bar. One of my favourite places is Bunni’s, a café not far from the Greek Embassy, that whilst only five floors up, has a balcony on three sides to look out over the South and West of the city including the African Union’s iconic tower. 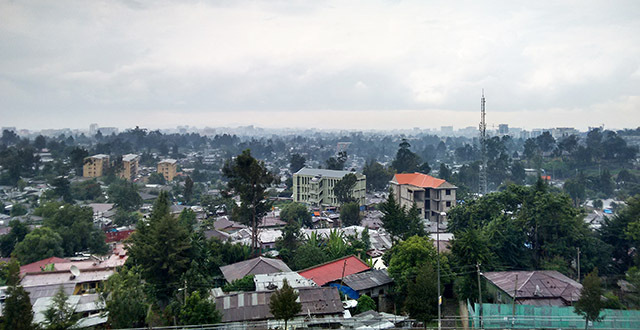 From here, you can almost make yourself believe that Addis is a lush and green city. Almost. The owner of the successful café chain, Limetree, has recently opened Kaba on the seventh floor of the Park Plaza building on Atlas junction. A modern Ethiopian restaurant, the food is good (injera aplenty) and with a large outside seating area, once the rains have gone, it’ll make a lovely place to enjoy dinner with a view. Some hotels have made the most of their position and height, but in my opinion, none of them have quite got it right yet. Harmony Hotel by Edna Mall has a mediocre bar and restaurant on their top floor, with a small amount of outside space, whilst Ras Amba Hotel between Kebena and Arat Kilo roundabouts has made more of an effort with their third floor bar which has a super view, yet remains somewhat uninspiring. The Intercontinental in Kasanchis is probably the winner with their rooftop pool and bar – it’s worth a visit. If you remove food and drink from the equation, climbing up into the Entoto Hills that surround Addis is by far the best place to go on a clear and sunny day. You’ll find dog walkers aplenty, a rock-hewn church (beyond the German Embassy) and a spectacular view that lets you take in all of Addis Ababa and beyond.